Summary: A fun vacation game turns destructive, exposing dark secrets, deeply buried grudges, and a shocking betrayal in Nicola Moriarity’s intriguing debut. I was really intrigued by the premise of this book before I realized who Nicola’s sister is (yep- she’s Liane!) So I wasn’t sure what to expect- would Nicola be like Liane or she would forge her own literary path? She does a bit of both, actually. 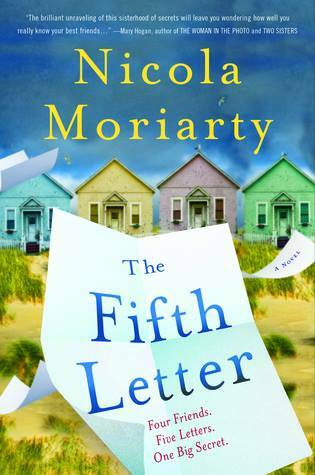 Parts of The Fifth Letter have a Liane Moriarty feel to them and some parts were Nicola putting her own mark in the literary world. How each time I thought had the secret letter writer figured out, I could never be quite sure. The hints and red herrings were equally spread through book. I ADORED who Joni talked to while she was dealing with the fifth letter. It was unexpected and provided a bit of humor at times. Bottom line: I found a bit of the talk of THE LETTER to be getting close to the talk of THE BARBECUE in Liane’s Truly Madly Guilty, but nowhere near as drawn out (Nicola’s book is over a hundred pages shorter + her confidante in THE LETTER matter makes talk of the letter enjoyable!) Recommended. Book clubs need this on their TBR list! I can’t wait to read this book! I am on the waiting list at the library. I love the cover & the story sounds very interesting. It is different from what I normally read but I’m looking forward to it! YAY! It’s really a good book, imo!